What do you do when its going to be a scorcher? Find the biggest gum tree you can and chill out during the heat wave! Our girls have secured a great possie down by our spring fed dam under some majestic old gums. Plenty of shade, feed and water and they’re happy chookens! Tom the Maremma of course has done a preliminary patrol of the area to make sure it’s safe and now has settled down for the day in the shade! We hope you stay hydrated and out of the heat this week too! Great minds think alike! We are proud to announce that Sylvia and her team at The Seasonal Garden Cafe have come on board with using exquisite tasting local eggs from Adelaide Hills Pastured Eggs. Sylvia loves creating meals with local and seasonal produce. We are honored that she found our eggs to be the perfect fit for the dishes she creates. The Seasonal Garden Cafe is often cited as one of the best restaurants in the Adelaide Hills and now with pastured eggs on the Menu they will be cooking up a storm. For Sylvia the emphasis is always on the highest quality possible and she described our eggs as “beautiful”. Our girls lay fresh, nutrient rich exquisite tasting eggs for The Seasonal Garden Cafe, so get along and taste the difference. Is your Local Cafe/Restaurant using “Pastured Eggs”? You should want the best for both your family and yourself. So when your next out and about in the Adelaide Hills enjoying breakfast you should ask your favourite cafe/restaurant “Are the eggs pastured?” If its not on the Menu then how do you know what type of eggs they are dishing up? Pastured eggs offer higher levels of beta carotene, vitamins A and E and less saturated fats compared to Factory farm eggs. At Adelaide Hills Pastured Eggs we pride ourselves on delivering a nutrient rich egg that is exquisite to taste. So ask for “Pastured Eggs” as the gold standard for quality and taste. You are paying for it, so you might as well have the best. 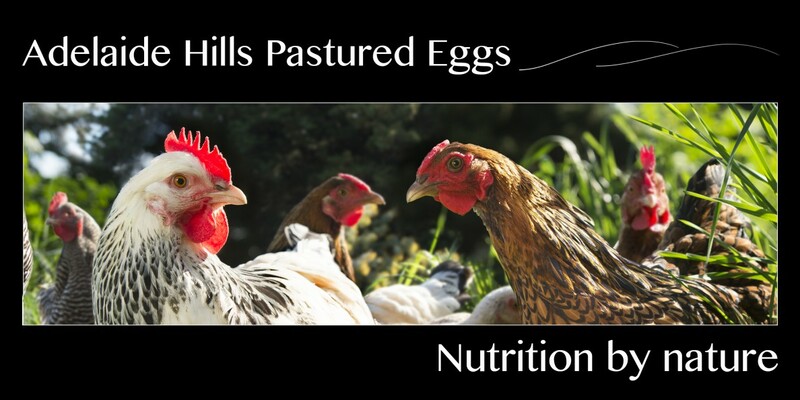 Not all eggs are created equal and at Adelaide Hills Pastured Eggs its simply Nutrition by nature.